Oaxaca’s “Mitla Tour” – Ancient Zapotec Ruins & More! Home of the "Tule Tree"
The "Tule Tree," 190' around! The baby Tule Tree, just 1,000 years old. What fantastic creatures lurk here?. All these colors were obtained from flowers or bugs. A manmade pool to control the water flow a bit. Kids play in the water. microscopic layer of minerals behind. Petrified waterfall at Hierve el Agua. Reminded us of Yellowstone but the water was cool..
Mitla is square and ornate, very different than Monte Alban. Intricate patterns like this adorn every wall inside and out. Precise mortarless stonework from 2,000 years ago. Massive lintel over a short doorway. One of the interior rooms. of precisely cut decorative stone. No two patterns on the buildings are alike. One of the underground tombs. Mezcal makers!! The king of Matatlan. There are hundreds of varieties of mezcal. Pineapple-like core used to make mezcal. First they are cooked over a fire. Then they are crushed under a rotating wheel. tour of the Mitla ruins. would have probably stuck around for a day or two! was once surrounded by tule reeds. could always buy a souvenir postcard instead! total 4,841 years of age. spool precariously on one knee. familiar spinning wheel with them. over the years to perfect these methods? from undyed sheep wool by Rafaela, whom I met (but didn't think to photograph--darn!). there are literally hundreds of them. So this seemed a perfect souvenir. waterfalls out in the mountainous hinterlands. National Park, except the water is cool. the next cascade. There is a mystical, ethereal quality to this place. places we'd been and where we wanted to go. whereas Monte Alban was already in decline. as they could, and used the stones to build a church on top of one end of the ruins. city of Oaxaca didn't even make these buildings flinch. headed to a Mezcal tasting. of Mexico are called Mezcal instead. And there are hundreds! makes Mezcal the old fashioned way. throat and has a pleasant flavor. they were serving this stuff in thimble sized cups. to Puerto Chiapas and then inland to Antigua, Guatemala. Find Oaxaca (Mitla) on Mexico Maps. Carved stone figures at Monte Alban's museum. A local school group is on a field trip. The teacher asks which god he is pointing to. Looking across the central plaza. "You are here" in Zapotec. School kids burn off energy out on the stairs. Now they can sit still for a class picture. Pyramid building unchanged since "discovery" in the early 1800's. Ceiling art in the Cultural Center. Grand double staircase in the Cultural Center. a particular image represented, their hands shot up. They knew. old age, wisdom, fertility and other things. 200 and 500 AD, some 800 or so years after its construction. Taking the path less traveled, we entered the ruins from a track that went around the back side. had dug up in their farm fields. Hmmm. back side of the ruins!! building, taking photographs and saying "Wow!" to each other. later and crushed all things indigenous. holding them up to the sky. sat obediently for a class picture with their teacher. buildings with such tall steps. the last 500 years are all finely displayed. order you go through it. by a boatload of treasure. Spanish like so many other tombs in other places. guys eventually succumbed to the Aztecs…"
last of all the Village People." Find Oaxaca (Monte Alban) on Mexico Maps. Cobblestone colonial walking streets of Oaxaca. A band plays pops tunes. A marching band shows up out of nowhere. A street vendor strikes a deal on her fruit. "Marriage" has nasty thorns and poisonous fruit. This little Chiclet-selling girl was transfixed. the bandstand jigging and jumping and running. a marching band in the distance. bought some munchies for himself and his wife. stood in rows behind and around them. charming rendition of the song. so very charming to watch. stage at the appropriate moments. around the square were all just part of the scene. are really well trained. They sell boxes of Chiclets, candies, bobble toys and cigarettes. town. No wholesale pricing there, but they mark up their product pretty darn well. and sister stopped by our table as we sipped on a beer. hand at me again. "50 pesos!" ever challenged her like that before, and she was stumped to find a response. "50 pesos!" used to staying out however long mom needed her to be selling Chiclets. peanuts, wrapped up the napkin, and shoved it in her basket. In a flash she and her brother vanished into the night. audience, and street vendors wandered through it all. flowers, and he got some wonderful shots. manage on the tiny garden paths. accidentally get cross-pollinated and hybridize with something else. bothering its host except for sitting in its lap. were everywhere, and love was definitely in the air. to get a good angle with my camera. A wedding in the cathedral!! grandest, most gold-filled, most magnificent cathedral imaginable as a backdrop. image of pride as he shook hands with his guests around him. entertained during the coming hours of celebration. straight at me and motioned for me to come into the cathedral. a wedding at this cathedral, wearing shorts and a tourist hat. long, so I snuck back out once the priest got going in earnest. face was touching -- and heartbreaking. muscle cars from the 1960's like they were the sexiest of pinup models. of them. How many princess weddings can make a girl's heart soar? Oaxaca held us tightly in its clutches and we still had more to see, espeically the ancient Zapotec ruins of Monte Alban. Find Oaxaca on Mexico Maps. Snacks for sale at a bus stop. Mountains on the way to Oaxaca. Outdoor eateries surround the Zócalo. We walk down towards the historic district. Oaxaca is loaded with charm. One long cobbled street is set aside for pedestrians only. Many buildings have a door-within-a-door out front. The front of the public library. The courtyard inside the public library. people spill all over the sidewalks. 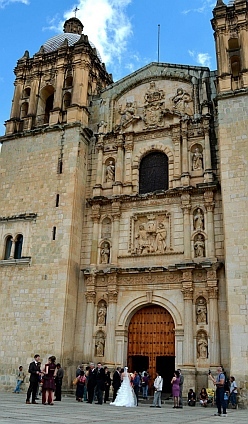 Sculptures of "migratorios" congregate by the cathedral. Inside the cathedral - gold, gold and more gold!! The overriding theme is gold. A portion of the ceiling. Uniformed schoolkids hang out by the cathedral after school. Paintings for sale on the sidewalks of the art district. Home of former president Benito Juarez. Protesters cruise past us carrying signs. one stop. Or you can fly for $100. so the brawny guys could lift the heavy luggage out of the baggage compartment for inspection. long. At lunch time the bus stopped for half an hour at a cute little roadside restaurant. on the phone and necking. hoofed it straight down to the old town district. gate and rooftop terrace. It is a city with a past and a soul. is both historic and hip at the same time. with a view onto the city streets. smaller utility door cut into it. into its main front gate. staircase going to the second floor. Mexico and the USA along the most common migration route. Now they stand around the Oaxaca's beautiful cathedral plaza. disputes and violence in their hometown. unstoppable ambition and its dramatic quest for happiness and prosperity. conversation with a "hello" to friends and family back home.